Serving as an Industrial Associate at Matthews Real Estate Investment Services™, Jack and his team specialize in industrial assets in the Dallas Fort Worth metroplex. He leverages his strong economic and business background to provide an exceptional level of value to his clients. 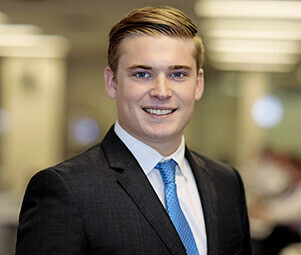 Jack’s extensive market knowledge further enhances his ability to analyze industry segments and assess client’s individual positions to boost their overall investment. Prior to Matthews™, Jack served as an associate at Patriot Parks Commercial Real Estate where he assisted in the acquisition of self-storage and mobile home parks across the Southwest. Jack also played a huge role in overseeing renovations and management changes of various properties as well as working with clients to find the best possible solutions to any issues that arose during the transactions.